Ahh, Hollow, we reunite again. I had purchased my first Illamasqua Cream Pigment in Hollow from BeautyBay.com a couple years ago, loved it intensely, but last year I don't think I reached for it even once.. Partly because contouring powders such as Surratt Griege and Kevyn Aucoin Contour in Light had taken over, partly because I didn't feel comfortable with using a cream product that was a couple years old. I finally decided to toss it and after my no-buy ended I happily discovered Beauty Bay was having it on sale! 14 euros (~$17 USD) felt like a bargain and in my cart it went. Let's talk if it was worth re-purchasing. Illamasqua is a British makeup company known for their angular packaging. At this moment they have Cream Pigments in 6 shades, I'm personally reviewing just Hollow, which is their cult shade for contouring the face. These pigments are advertised as multi-purpose use: eyes, face and body. The formula is matte and supposedly crease and water-resistant. One Cream Pigment has a generous 8g of product for £18/ €20.30/ $24.70, but I'd look for sales. Made in Germany. The packaging is a see-thorough angular jar with a separate black lid. Unlike many "whipped" cream eyeshadows (such as Tom Ford or Charlotte Tilbury), Illamasqua's pigment in Hollow is quite a dense cream. The texture reminds me of a firm pot concealer more than an eyeshadow or a cream bronzer. If you've tried Laura Mercier's Secret Camouflage or NARS Soft Matte Concealer, I'd say the texture is somewhere in-between. I could imagine you get a better color pay-off by "warming up" the pigment similarly to waxy concealers, but personally I avoid sticking my fingers in the pot for hygiene reasons. You can pick up some product with a spatula, but of course that's a hassle. I would prefer a softer cream, but I guess the firmness improves the longevity and water-resistance. Hollow is advertised as very pigmented for professional use, but I'd say the pigmentation is light-medium if you use a brush. Perfect for day-to-day natural contouring as the color can be built up and is hard to overdo. The cream isn't exactly dry, but due its density it needs some working to get a proper amount on the brush - I wouldn't mind this except I've got a hair or two from the brush into my cream, which is quite annoying. 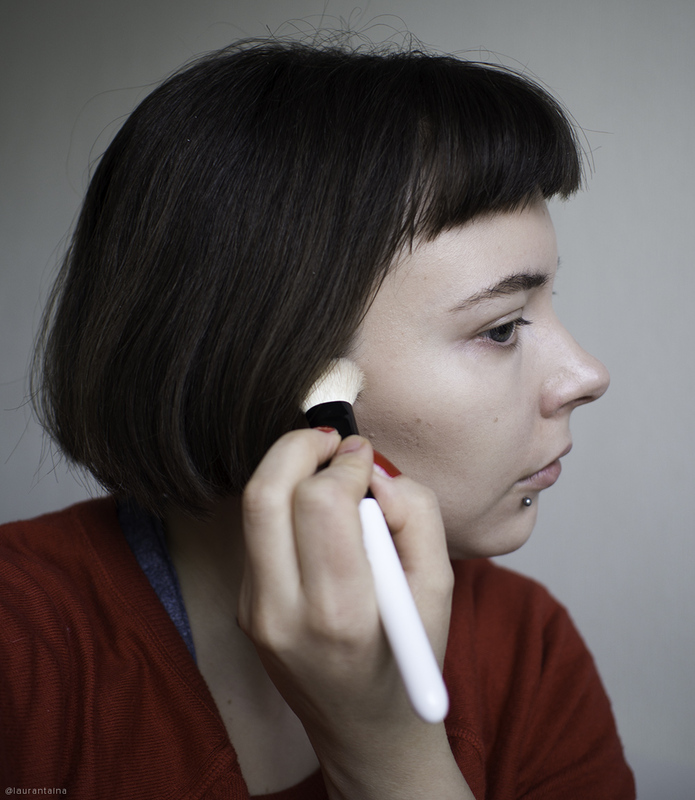 For cream contour I like to use my small Koyudo foundation brush, which I find perfect for contouring the non-existing hollows of my cheeks and defining the jaw-line. Shaquda's angular 812 foundation brush would be my second choice. A dense makeup sponge could also be a good alternative for picking up the product, but I always reach for my Japanese brushes. I find the cream too firm for using your fingers for blending without dragging your skin. "For science" I did try a finger application to see if the warmth of my hands would help with the stiffness issues, but sadly blending with a brush didn't get any easier. I'm not too scared the cream pigment will dry out when I have the jar open, but to ensure freshness I would prefer a clicking or magnetic closure. Having only a simple lid for a cream product seems a bit dated for me. I was never a fan of Illamasqua's angular jars as I don't find them very visually elegant, plus it's hard to get to the angular corners of the jar. I start shading my cheekbones near my ear, working my way down. The pigment blends easily to my skin and I haven't noticed my foundation moving underneath. I've also used Hollow after slightly dusting my face with a finishing powder without any problem: no pigment sticking to the powder or going patchy. If you have breakouts on your cheek area, pinpoint concealing and working with a cream pigment could be troublesome - in this case I would opt for a powder contour. I do have to pick up the product a couple of times to build up the intensity, but I prefer working with subtle layers instead of blending out too intense contour. Hollow is a cool taupe leaning ashy grey. For comparison I've swatched some of my most used liquid and powder contour products. You can see how much greener the Kevyn Aucoin is? Also a well-loved cult product, but if this shade didn't work for your skin tone, there are other alternatives. Rouge Bunny Rouge's is significantly redder (but a pleasure to use - review here), the Surratt would be the most neutral in my opinion. Illamasqua's Hollow should be talked about more often as it's a wonderful ashy contour shade for fair to light skin tones. Unfortunately I don't think the color transfers on very olive or medium to deep skin tones. I wish Illamasqua had similar pigments for other skin tones, but the rest of the pigments are more colorful (I'm not sure if Hollow was originally intended for contouring). Thanks to Hollow's dry and firm texture, I imagine it suits well for a variety of skin types and would last long even on oily skins or in a humid climate. If you're acneic I would double cleanse especially carefully after using the pigment, making sure you remove all traces of makeup (and mineral oil). But in the end.. I'm not head over heels when it comest to Hollow. It wasn't as good as I remembered. Maybe I got a drier one or my taste in contour products has changed, but I found the the stiff texture is somewhat annoying to work with. If you have the time, it does look pretty, but you need to put in some effort. 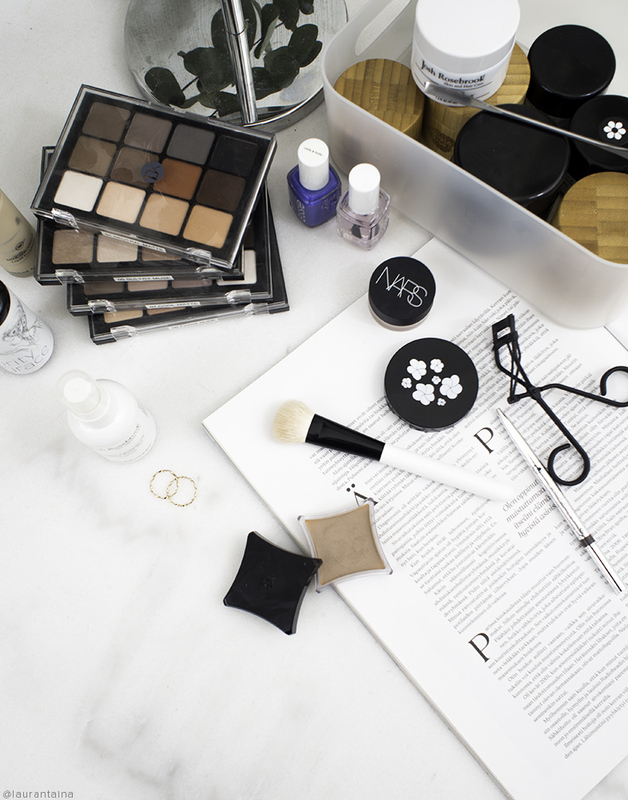 What's your favorite contouring product?